Forgive Me, Father - For I Have Killed! Rahne Sinclair Has A Baby On The Way - But Instead Of A Calm And Peaceful Birth, There's A Hard Labor Coming. Haunted By Her Actions As A Member Of Wolverine's X-Force, Rahne Returned To X-Factor In Search Of Peace, Friendship And Spiritual Convalescence. Instead, She Finds Powerful Forces Determined To Steal Her Unborn Child. Their First Gambit Is To Separate Her From Her Friends; Their Second Is Too Horrible To Contemplate. 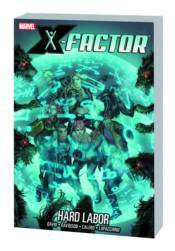 With Rahne Alone And On The Run, And X-Factor Desperately Trying To Find Her, A Pair Of Mysterious Wolfenkind Emerge From The Shadows - But Do Feral And The Werewolf By Night Want To Help Her, Or Are They Part Of The Pack Seeking To Do Her Harm? Collecting X-Factor (1986) #220-224.